I’ve written about the caipirinha before, but I’m happy to write about it again, because it’s a great drink. Build in glass: add lime and sugar to an old fashioned glass. Muddle well. Fill glass with ice. Top with cachaça. Give quick stir to incorporate. Using a shaker: in shaker, muddle lime and sugar. Fill old fashioned glass with ice, add ice to shaker. Add cachaça, shake well, pour back into old fashioned glass. If you substitute rum, you have a caipirissima. If you substitute vodka, you have a caipiroska. If I have other fruit on hand, I will usually muddle that in as well, to add even more layers of flavor. Do take it easy on the sugar. You can always add a little more in, especially if you’re using simple syrup. Be sure to let the wonderful grassy flavor of the cachaça shine through. No matter what way you make it, you must always muddle to get the flavor of the lime zest in your drink. If you use straight lime juice, you’re making a daiquiri. And you must always take it easy, because this is a casual fun drink. In the BarSmarts video, David Wondrich shows a new-to-me method for preparing the lime. I’ve usually just cut in in half through the equator, and cut each hemisphere into quarters. Instead, he recommends cutting it half through the poles after removing the tops, then removing the central pith, then cutting the lime into six parts. While this method takes a little longer, I think it gives more pleasing results, both in the glass and in the mouth. 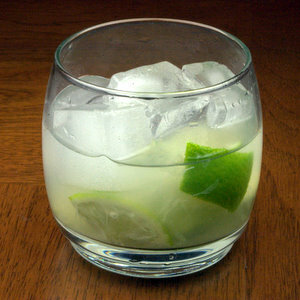 What’s your favorite way to prepare a caipirinha? I prefer to build it in a glass and always use sugar instead of simple. This allows me (or guests) to stir in and dissolve only as much sugar as they wish. Here in Brazil people tend to use way too much sugar for my taste so this little touch is well appreciated. When you shake it you dissolve the whole thing and if the bartender has a heavy hand for sugar you have to stick with it. As you said, you can always add more sugar if desired. I played a lot with removing the central pith and don’t really think it´s that necessary when you cut your fruit to order. The cut Mr Wondrich shows is very traditional around here and its worth knowing. I generally go for wedges or big cubes. Some people disagree and prefer to stick to the traditional, but side by side I doubt its noticeable when using fresh fruits. Sometimes I often see people cutting their lime in very small pieces, not something I really recommend. The smaller the pieces the more loose pieces you have to clog a straw or get in your way. My way to make and drink the Caipirinha is here. Last summer the Caipirinha, Caipirissima or Caipiroska was fovorite drinks my and my friends. I haven´t tried that way of cutting the lime, i will definetily do that. If you were serving Caipiroska’s at a party, but were concerned that the drink could be too strong, what would you do to cut it? Do you think adding club soda, or lime juice, or lemon-lime soda would ruin the drink? What proportions would you use? Heath, I frequently add club soda to my caipirinhas, maybe 4-5 ounces. You’re moving closer to a mojito at that rate, but there’s nothing wrong with that!